For a number of years Cascade Policy Institute has published my short commentary about Welfare Santa, inspired by an Andy Rooney column written in 1991, the year Cascade was founded. This year is a little different. Andy died last month at the age of 92, and the Occupy movement has highlighted the “get something for nothing” mentality. Do you believe in Santa Claus? By the time most of us stop believing in a literal Santa Claus, we are well on our way to believing in a figurative one that goes by the name welfare state or big government. Have trouble feeding your family? Santa State can help. Need affordable housing or health care? Welfare Santa to the rescue. What in the world got me to say such blunt things at Christmas? 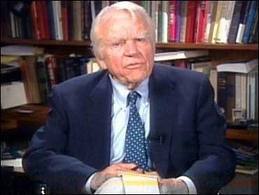 I put the blame squarely on Andy Rooney, who wrote a Scrooge-like piece for TV Guide back in 1991. Entitled “No, Virginia, you don’t need a Santa Claus,” it was Andy’s answer to the eight-year-old girl who in 1897 asked that question heard around the world. Santa, you’re a swell guy, but we’ll take it from here. As adults, we need to trust in ourselves, make our own decisions, and not let others fool us into believing we can get something for nothing. Virginia, it’s not a bad thing to believe in Santa Claus, just don’t stop believing in yourself. Cascade Policy Institute’s founder and Senior Policy Analyst Steve Buckstein is also Satirist-in-Residence at Oregon’s free market public policy research organization.